For other people with the same name, see Dennis Scott (disambiguation). Dennis Eugene Scott (born September 5, 1968) is an American retired professional basketball player. A 6'8" small forward from Georgia Tech, and the 1989–1990 ACC Men's Basketball Player of the Year, Scott was selected by the Orlando Magic with the fourth pick of the 1990 NBA draft after being the leading scorer on a Yellow Jackets team that made the Final Four, and comprising one portion of Georgia Tech's "Lethal Weapon 3" attack featuring Scott, Kenny Anderson and Brian Oliver. Scott played for Coach Stu Vetter at Flint Hill in Oakton, Virginia. Flint Hill Prep finished ranked #1 in the nation Dennis' senior year ('87) as ranked by USA Today. In his junior year at Flint Hill Prep, his team finished ranked 2nd in the nation by USA Today and 1st as ranked by Blue Ribbon yearbook. Given his size, strength, shooting ability, and quickness Dennis played every position at one time or another during his high school career. Scott spent the majority of his career with the Magic, earning the nickname 3-D for his ability to consistently make long three-point field goal attempts. Until the drafting of Shaquille O'Neal in 1992, Scott and Nick Anderson were the leading scorers for the Magic. In 1995–96 Scott set an NBA single-season three-point field goal tally with 267 (which was broken ten years later by Ray Allen). He also set the NBA record for most three pointers made in a single game with 11 on April 18, 1996. On his record breaking shot the assist came from teammate and the holder of the record, Brian Shaw (he made 10 three pointers on April 8, 1993). This record has also since been broken by Kobe Bryant who made 12 three pointers on January 7, 2003, Donyell Marshall who made 12 three pointers on March 12, 2005, and Stephen Curry who made 12 three pointers on February 27, 2016; Curry now owns the record by himself following 13 baskets from behind the arc against the New Orleans Pelicans on November 7, 2016. Scott was honored by the Magic on March 26, 2006 as part of their "Remember the Past Nights" program, where the Magic remembers past players for their accomplishments. Other players to be honored so far were Nick Anderson and Scott Skiles. In 2008, Jay Bilas ranked his personal top 25 three point shooters in NCAA history and Scott was #1 on his list. In addition to his seven-year career with Orlando, Scott also spent short stints with other teams. On September 24, 1997, he was traded to the Dallas Mavericks for Derek Harper and Ed O'Bannon. 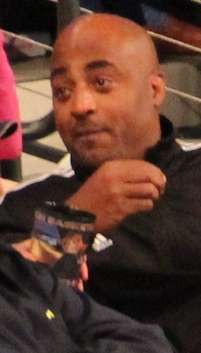 Midway through the 1997–98 season, the Mavericks traded Scott to the Phoenix Suns for Cedric Ceballos. He also played for the New York Knicks, Minnesota Timberwolves (1998–99) and the Vancouver Grizzlies (1999–00). Scott did not play in the 2000–01 NBA season after being cut by the Washington Wizards in training camp. In 2001, he attempted an NBA comeback with the Los Angeles Lakers (With ex-Orlando teammate and friend Shaquille O'Neal) but due to the abundance of veteran talent already on the roster, the Lakers decided to go with another player and cut Scott after training camp. Currently Scott serves as a commentator for NBA TV and radio analyst for the Atlanta Hawks. Scott has also served as general manager of the Atlanta Vision of the American Basketball Association. ↑ "Ramblinwreck.com "Lethal Weapon 3" article". 1 2 "Forward Thinking: Lakers sign Dennis Scott, Paul Shirley." www.cnnsi.com, September 28, 2001. Retrieved April 24, 2014.